To celebrate the holidays, NAWBO Miami and NAWBO Fort Lauderdale held a joint reception on December 8 at the MDC Museum of Art + Design. The dual goals: donate to charity and enjoy some of South Florida's artistic treasures during networking with old and new friends. Proceeds of $560 went to the Miami Rescue Mission after a raffle with many prizes from local companies and individuals. 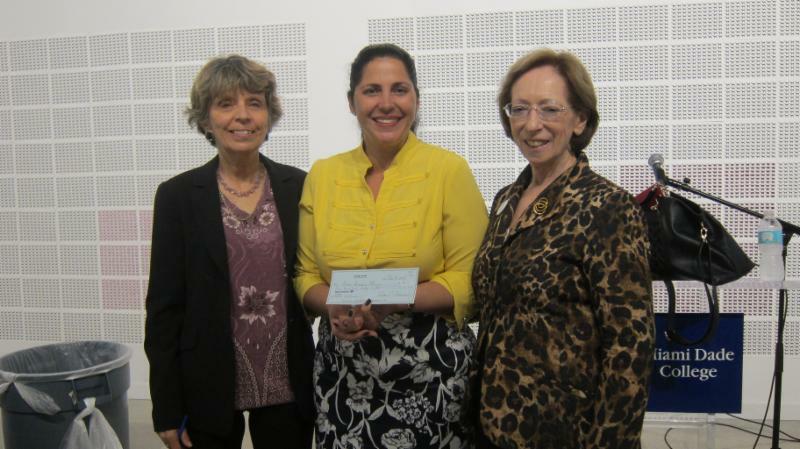 President-elect Susan Dierenfeldt-Troy at left and President Alma Kadragic at right give check for $560 to Lian Marcos of Miami Rescue Mission. Photo Courtesy of Jennifer Ohl. Museum Executive Director and Chief Curator Jeremy Mikolajczyk guided guests around the permanent collection and the current exhibition. Thanks to the Museum of Art + Design for hosting the reception. Thanks also to Wayne Eldred and Tarpon Bend Raw Bar & Grill for sponsoring the wine. Last chance to get the special rebate for joining NAWBO before the end of 2015. The Miami chapter will refund $25 from the $300 membership fee. Click here to join. After you have joined NAWBO, you can get a discounted Trustee-Level Membership to the Greater Miami Chamber of Commerce, Coral Gables Chamber of Commerce, and Miami Beach Chamber of Commerce, or all three. You become a Trustee member for a fraction of the cost. Contact info@nawbomiami.org for details. Program for 2016: Under development. News after January 11, 2016.